Ok…a few quick fire posts…last night we had 4 gorgeous salmon fillets to deal with and my kids wanted pasta – so I did a version similar to another earlier dish on this blog but with a few differences. Firstly, it was fresh salmon which I wrapped in foil with a little unsalted butter and baked for 20 minutes at 160c. I then skinned it and flaked it. In a frying pan I popped a carton of crème fraîche and 50 gm of unsalted butter and stirred over a low heat until it melded together. I then added a teansy weansy dash of sea salt and a few grinds of black pepper and about a teaspoon or so of dried tarragon-fresh would have been better but forgot! I then added the flaked salmon and stirred it gently once more. I left this to one side whilst the pasta cooked al dente, drained it and tipped the creamy unctuous salmon mix in and allowed it all to get very friendly. Variations – well, you could first pan fry a small onion finely chopped until soft, then add a glass of dry white wine and let it bubble together, then add the crème fraîche or single cream if you prefer – no need for butter in this case. You could also add a cup of peeled prawns as well as the salmon. You could also plump for dill instead of tarragon. 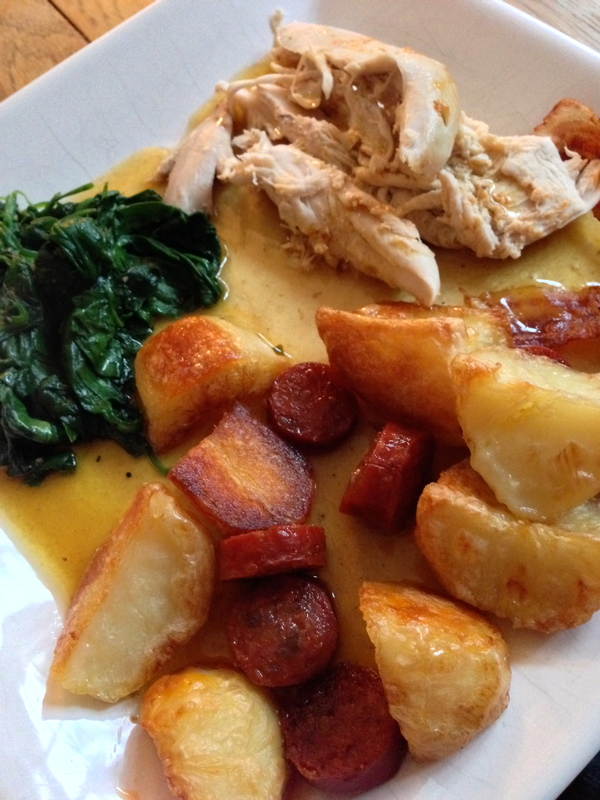 Today’s Sunday lunch was so simple I will not bore you with the recipe – even Simon on his simplest of days could sort this one out. Suffice to say that, with the rain dribbling down my windows, food with an autumnal smokiness was needed – what better ingredients than chorizo and paprika…… I could almost feel the pagan pangs of bonfires and mist laden gatherings coursing through me as I assembled the dish – or maybe it was the the third glass of smoky shiraz… Anyway, I poured a glug or two of olive oil in the cavity of the free range bird, smothered her skin in paprika, then barded her with pancetta strips. She looked devilish. The smells from the oven as she cooked made me want to go out and do druid dances round my chiminea. I resisted. I served the chicken with quartered roasted potatoes, to which I added a dozen slices of chorizo for the last ten minutes. Delightful. I also steamed some spinach in my wok. Then squeeze drained it – popped it back in the wok with a knob of butter and bags of black pepper for about two minutes on a high heat to let it meld together. Everyone was a winner – even the cat got a slice or two of the paprika blessed bird. She is snoozing now…and I am going shortly to join her! One of those cold damp nights that needed a solidly substantial yet velvety pasta dish to nourish the nerves, soften the stress and warm the marrow. I decided to cobble together two of my favourite pasta dishes – both on this blog – and it worked perfectly. 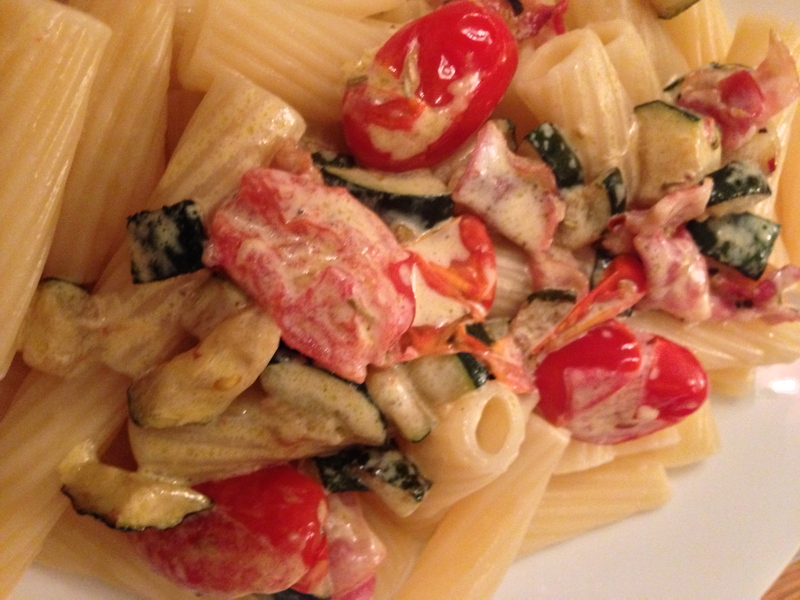 The creamy tomato pasta with the lardons and courgette pasta. But instead of lardons I had some wonderfully fragrant strips of pancetta. Washed down with a rugged French wine this was a delight. Pan fry the courgette in the olive oil for about 5 minutes then add the garlic. Continue til the courgette begins to brown then add the tomatoes. Add the chilli and the rosemary. Just to warn you at this point – the aroma is stunning! Put the pasta on- takes 11 minutes normally. 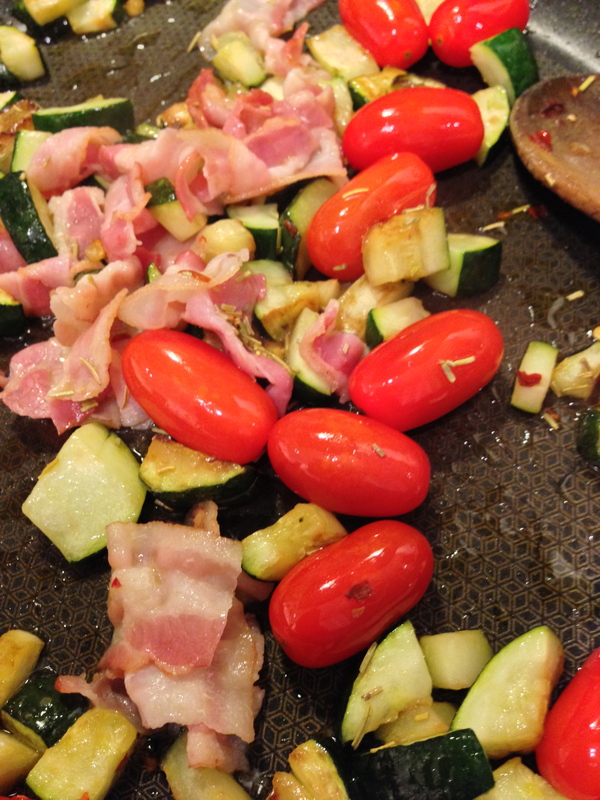 Fry the courgette mix gently for around 8 minutes then add the pancetta. Once the pancetta starts to crisp, about two minutes, add the cream. After a minute add a grind of black pepper. Drain the pasta and spoon over the creamy mixture. Pasta Broccoli…seriously good for you! The photo does not really do this dish justice – if you have never tried this combo before – you must. I had something like this in a restaurant over the summer – and I think this is roughly how they did it – but anyway – I like it like this! It is simple, healthy and delicious. I was never a fan of this particular greenery but since reading an article on men’s health last year we are now best buddies! This following article is from research into broccoli and the advantages for men in particular – though it is, no doubt, great for ladies too! It caught my eye because I had a creaky joint – not that type! – it was actually my hip! – and, yes, this stuff is good for joints – so, if you can get through the article the recipe follows – but this is great stuff and worth knowing – I didn’t! Listen up! Ounce for ounce, broccoli has more vitamins and minerals than almost any vegetable you can eat. (Good news indeed!) Take vitamin K, for example. Broccoli is brimming with 93 micrograms of the stuff per cup. That’s good news, since K is essential for building cartilage and heading off joint inflammation as you get older. Broccoli also protects your peepers with an abundance of lutein and zeaxanthin, two cartenoids critical to vision. Florets harbour the bulk of broccoli’s carotenoids, including beta-carotene, which the body converts to vitamin A. It is also a good source of fibre and may help ward off cancer. Studies show that eating three servings a week of cruciferous vegetables like broccoli may slash your risk for prostate cancer significantly. Mix broccoli with tomatoes for even better protection. OK, some jargon there towards the end, but you get the picture. Broccoli is good for you! I guess you all knew that – it was more a learning curve for me…. Anyway, enough science! The recipe! Ok. Put your pasta into a big pan of boiling water – after 4 minutes add the broccoli. No need for salt, as the parmesan does the job later – but add some if you must! Whilst it is cooking ( I cooked it for a further 6 minutes) in a small frying pan, fry the garlic gently in a good, hearty splash of olive oil until it just, just turns a little brown. Strain the pasta and broc – reserve a tiny bit of the cooking water in the pan. Add the broc and pasta back to the pan and then add the garlic and the oil – stir round – grind over some black pepper and add the chilli flakes – stir gently then stir in the parmesan. Serve immediately – you can add more chilli flakes to your taste, or more parmesan, or even more oil at the table if you so wish. I like the broccoli a little more al dente than I cooked it yesterday – I took my eye off the pan! So be careful ! 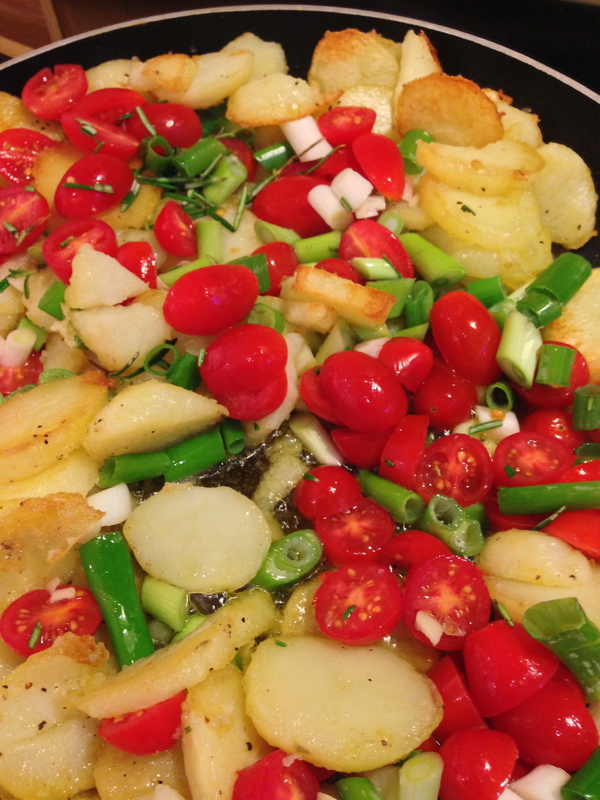 But it was, nonetheless, a great and easy supper dish – my kids loved it and it is now a firm fixture in my culinary simple supper repertoire. And, I know it is doing me….. deep within….good! Well it sounds good…and it tasted good too! I fancied making some pesto, so I popped a big bunch of basil into a food mixer with 25 gm of toasted pine nuts, a chopped clove of smoked garlic, olive oil and a pinch of rock salt. Whizzed it round, then decanted it into a bowl – added a good few gratings of parmesan and a little black pepper – then adjusted the mix with more olive oil until it was the consistency I like. Then I remembered I had chicken thighs to use! Oh well – bang went the spaghetti in pesto sauce. I popped on some Van Morrison and I deboned the thighs with sharp scissors, flattened them out and spooned on a helping of pesto onto each. I rolled them up – held them together with a cocktail stick each and popped them on an oiled baking tray. Oven preheated to 200c – they went in for 15 minutes – then I basted them – back in for 5 minutes. Out again and I wrapped some parma ham around each one. Back into the heat for a final 10 minutes and they were looking luscious and inviting. I lightly toasted slices of sourdough bread – spread them each with the remaining pesto. I carefully removed the cocktail sticks from the chicken and popped a thigh onto each piece. I served it with steamed asparagus in olive oil and a few shavings of parma ham. This is a really easy and tasty light supper – or it could be a starter too. Chicken and pesto – made for each other. and the asparagus chips in nicely with a fragrant crunchiness on the side. 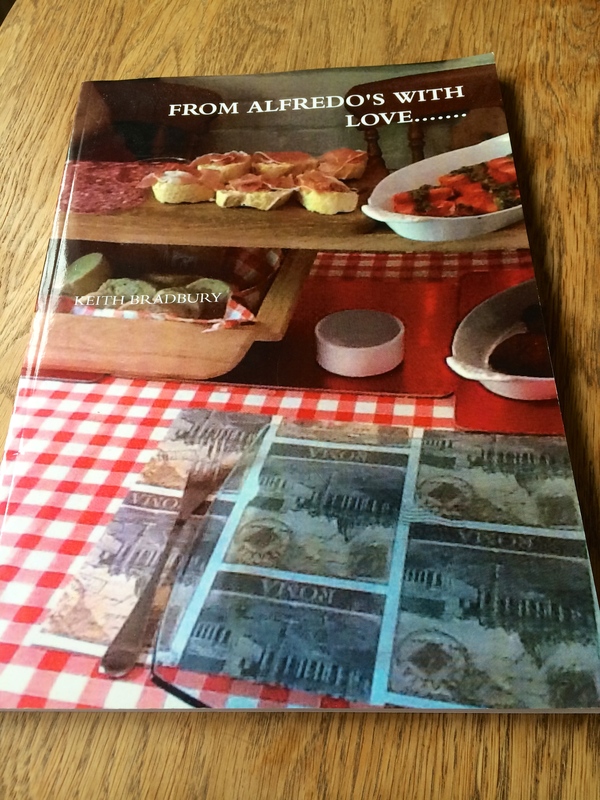 The family loved it and the silence as they ate said it all!